Breeding male southern rainbow skink Carlia tetradactyla, copyright Will Brown. Australia is home to a diverse and distinctive array of reptiles, most of which are unique to the continent. Perhaps the most famous of these are its venomous snakes and gigantic crocodiles, but the continent also possesses its fair share of lizards. Among these are the subjects of today's post, the rainbow skinks of the genus Carlia. Carlia is primarily a genus of the north of Australia, particularly northern Queensland. They are moderately-sized skinks, with a snout-to-vent length of up to seven centimetres (indicating a total length of about half a foot). 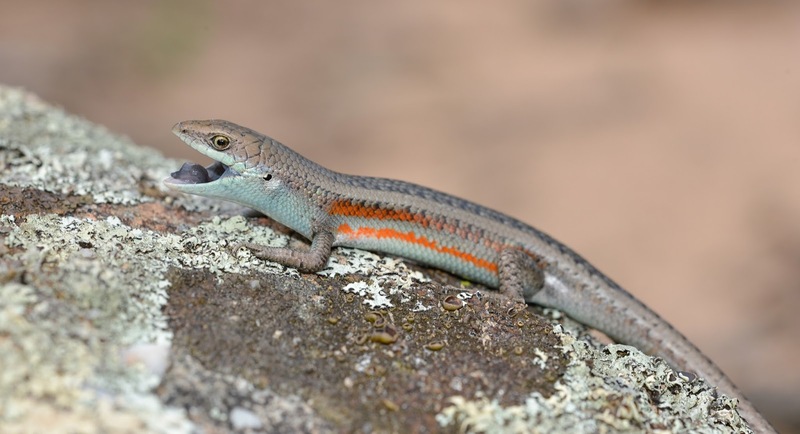 The vernacular name 'rainbow skink' refers to the bright colours, red, green, blue and/or black, exhibited by males of this genus during the breeding season. Females (and non-breeding males) are duller in coloration and commonly have a white stripe along the side of the body (Dolman & Hugall 2008). 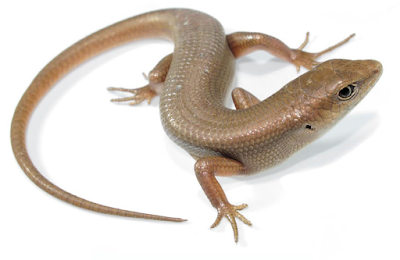 Only one of the more than twenty Australian species, the southern rainbow skink C. tetradactyla, is found in the southern half of the continent (specifically in a band from southernmost Queensland to northern Victoria). More than a dozen other species are found in New Guinea and neighbouring islands of eastern Indonesia; one species, C. peronii, is found on the island of Timor. Many Carlia species are difficult to distinguish without close examination and new ones continue to be described on a regular basis. Closed-litter rainbow skink Carlia longipes (perhaps a non-displaying male? ), copyright Greg Schechter. Carlia can be easily distinguished from most other skink genera in the region by counting the toes, of which there are four on the forefoot and five on the hind foot (Storr 1974). Some authors have included all such Australo-Papuan skinks in this genus, but following a molecular phylogenetic analysis Dolman & Hugall (2008) recognised three genera of four-toed skinks in Australia: Carlia and the two smaller genera Lygisaurus and Liburnascincus. Lygisaurus species are generally more slender than Carlia and often have smaller legs. Liburnascincus includes three species of large skinks with sprawling legs found living around rocks. Both these genera lack the contrast in coloration between the sexes found in Carlia; at most, male Lygisaurus will become reddish around the head or tail. Male rainbow skinks maintain territories from which they will vigorously exclude other males; a male may hold the same territory for several years (Langkilde et al 2004). Breeding males display themselves by flattening the body and tilting to one side, in order to optimise their apparent size and strikingness. Of the two Carlia species for which behaviour has been studied in detail, the black-throated rainbow skink C. rostralis is most likely to perform this display to other males, presumably as an act of intimidation. The lined rainbow skink C. jarnoldae, on the other hand, is more likely to perform its tilting display in the presence of a female (Langkilde et al. 2003). 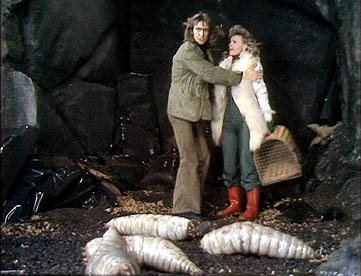 They may also display in this way towards predators, presumably to make themselves appear less digestible. Other displays performed by rainbow skinks include moving the head to display the coloration of the throat, or flicking the tail (this latter appears to be primarily a defensive display, being performed in the presence of predators or encroaching males). Langkilde et al. (2003) also found rainbow skinks to 'play dead' when captured, a rare behaviour in skinks (though known from other lizards). Admiralty brown skink Carlia ailanpalai, from Lardner et al. (2013). This species lacks the sexual dichromatism of other Carlia species. 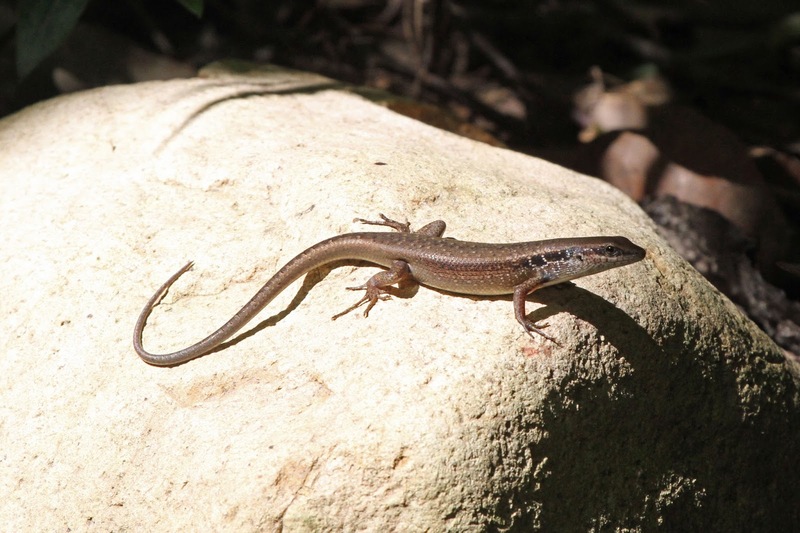 Rainbow skinks are also present in islands of western Micronesia, where they have been introduced by human activity. They were first recognised in Micronesia in the early 1960s, subsequently becoming abundant and seemingly supplanting native skinks in more disturbed areas. On Guam, they are also believed to have played a part in the spread of the brown tree snake Boiga irregularis: the healthy population of introduced skinks provided a reliable food source for the introduced snake. Because of the aforementioned difficulties in Carlia taxonomy, the exact identity of Guam's 'curious skink' was uncertain for many years though it was certainly part of the New Guinean 'Carlia fusca' group. A molecular analysis of Micronesian Carlia by Austin et al. (2011) confirmed that the species in question was the Admiralty brown skink C. ailanpalai but also found that skinks from different parts of Micronesia where connected genetically to different parts of the New Guinean archipelago. Rainbow skinks from Guam, for instance, were related to populations on Manus and New Ireland, whereas Palau skinks were more closely akin to New Britain residents. Austin et al. noted a correlation between the sources of each of the inferred separate invasions in Guam, Palau and the Northern Marianas and troop movements during World War II. While machinery and equipment was being transported to Micronesia for use in the Pacific theatre of war, skinks were apparently hitching rides. Alternatively, some could have reached Micronesia with equipment being returned to permanent military bases from New Guinea after the war's close. The resulting seed populations would have presumably been small, explaining why it took another twenty years or so before they were noticed. Austin, C. C., E. N. Rittmeyer, L. A. Oliver, J. O. Andermann, G. R. Zug, G. H. Rodda & N. D. Jackson. 2011. The bioinvasion of Guam: inferring geographic origin, pace, pattern and process of an invasive lizard (Carlia) in the Pacific using multi-locus genomic data. Biol. Invasions 13: 1951–1967. Dolman, G., & A. F. Hugall. 2008. Combined mitochondrial and nuclear data enhance resolution of a rapid radiation of Australian rainbow skinks (Scincidae: Carlia). 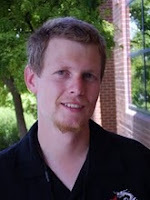 Molecular Phylogenetics and Evolution 49: 782–794. Langkilde, T., L. Schwarzkopf & R. Alford. 2003. An ethogram for adult male rainbow skinks, Carlia jarnoldae. Herpetological Journal 13: 141–148. Langkilde, T., L. Schwarzkopf & R. A. Alford. 2004. The function of tail displays in male rainbow skinks (Carlia jarnoldae). Journal of Herpetology 39 (2): 325–328. Storr, G. M. 1974. The genus Carlia (Lacertilia: Scincidae) in Western Australia and Northern Territory. Records of the Western Australian Museum 3 (2): 151–165.